Swing-Top Trash Receptacle 36 gal. If you've never thought of trash receptacles as a way of accessorizing your interior décor, think again. 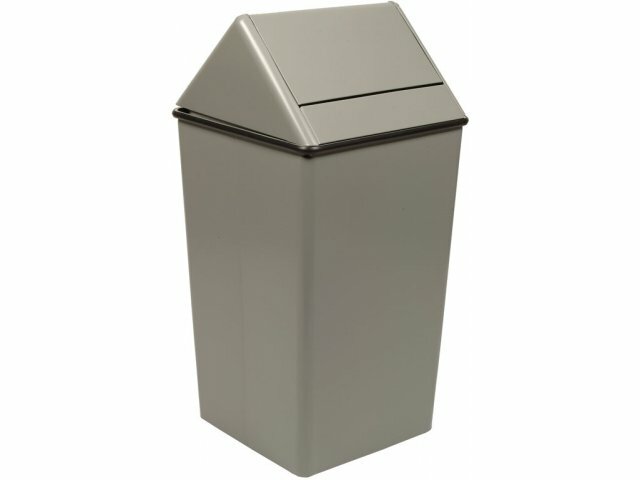 This steel trash can from Witt is not only highly durable and practical; it looks great, too, and adds a nice touch to any school building, business or campus. This large, hamper-style trash receptacle has a swing-top that's both aesthetic and user-friendly - no tops to lift or pedals to push. It is extremely durable, and built to withstand the heavy, daily traffic typical of schools and businesses. The unique "flame-out" design smothers flames in seconds, eliminating concerns about smoldering cigarettes that so often get thrown into public trash cans. Fully ADA compliant, it's also suitable for companies and schools privileged to serve those with special needs. While it may seem unimportant, the truth is that the right trash receptacle can make a big difference in the daily maintenance of your premises. This trash can from Witt fits the bill, for more reasons than one. 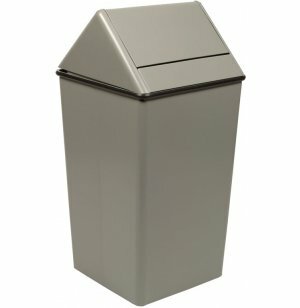 Attractive Design: Pretty colors and aesthetic design make this trash receptacle an attractive addition to offices, schools, malls, campuses and more. Highly Durable: Heavy-gauge steel construction stands up to daily use, while four feet lift this trash can off the floor to prevent scratches and to facilitate general cleanup. Large Capacity: Large size prevents cleanup staff from constantly having to empty receptacles. Super-Safe: Unique "flame-out" design safety feature smothers fires instantly - no need to worry about users throwing in lit cigarettes. ADA Compliant: User-friendly for all your clients and patrons, including those with special needs. Optional Liners: Optional heavy-duty plastic liners are available, to extend the life of your trash receptacle and keep it clean.